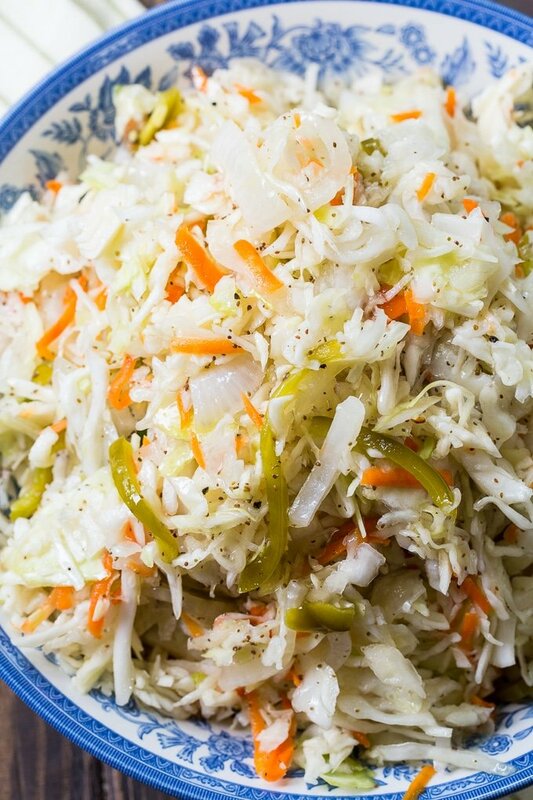 Sweet Vinegar Coleslaw is a sweet and tangy non-mayo based coleslaw that makes a great addition to any bbq or picnic. 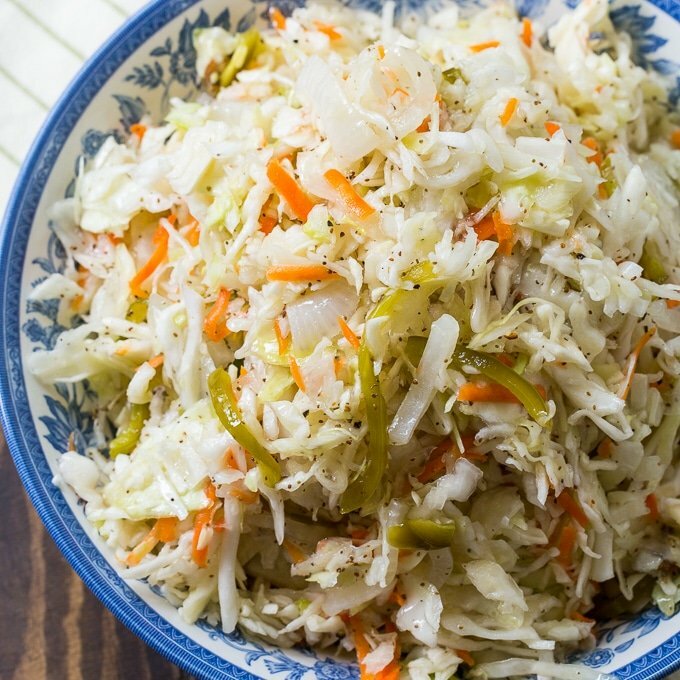 I think it is my very favorite coleslaw recipe. It has a pickled taste to it which I love. 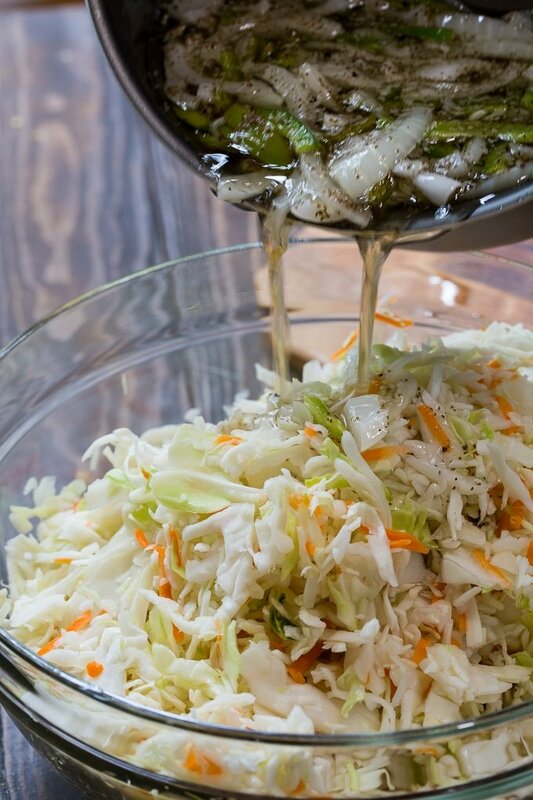 This Sweet Vinegar Coleslaw recipe can be found in 12 Bones Smokehouse: A Mountain BBQ Cookbook. If you’ve ever eaten at 12 Bones in Asheville, NC, you know they have some seriously good food, especially the Blueberry Chipotle Ribs. OMG! 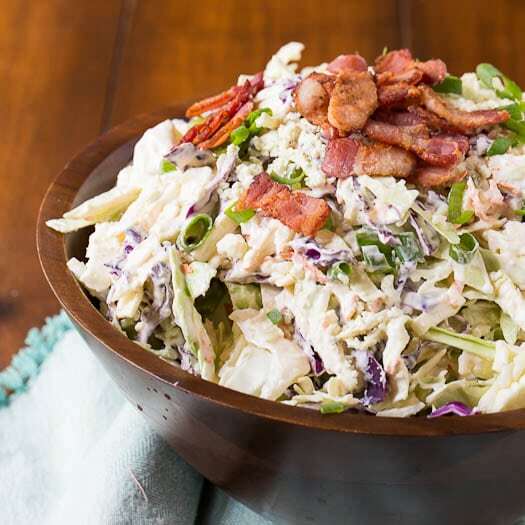 This coleslaw is made in a slightly nontraditional way. You bring a mixture of vinegar, sugar, and oil to a simmer and add celery seed, salt and pepper plus thinly sliced onion and green pepper. The onion and pepper get soft and pickled in flavor. Then you pour the hot mixture over coleslaw mix. The cabbage gets a little bit wilted and picks up so much flavor. 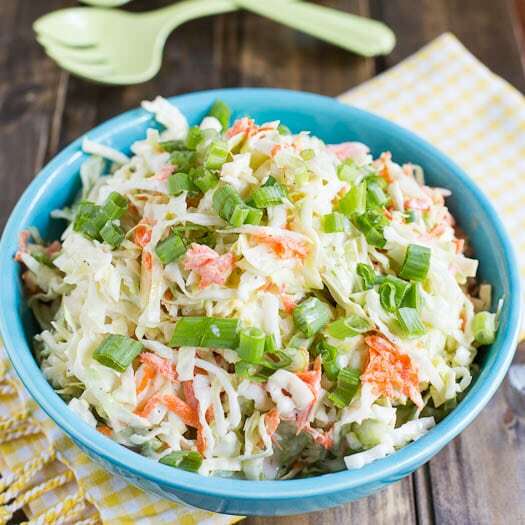 It’s a super tasty alternative to a mayo-based coleslaw and it makes a refreshing side for the summer months. It goes perfect with bbq pork, especially Carolina-Style Pulled Pork and Dr. Pepper Pulled Pork. 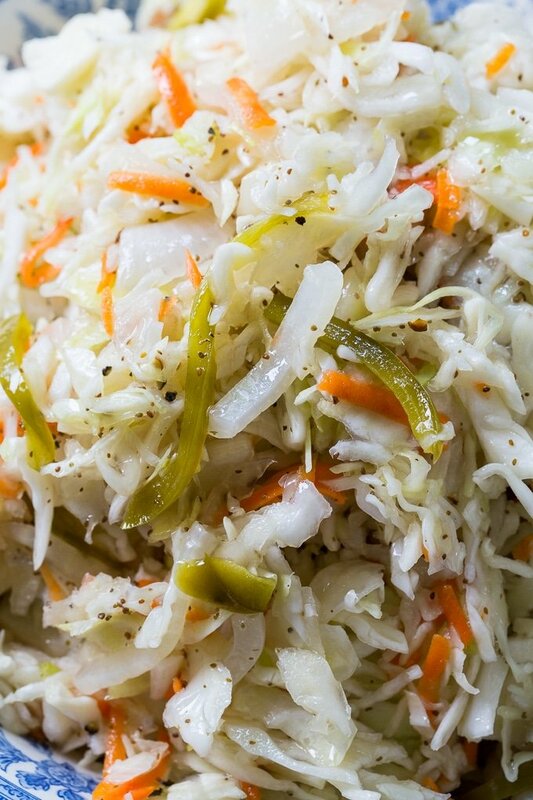 Sweet Vinegar Coleslaw is a sweet and tangy non-mayo based coleslaw that makes a great addition to any bbq or picnic. Combine sugar, oil, and vinegar in a medium saucepan and bring to a boil. Reduce heat to medium. Stir to dissolve sugar. Add celery seed, salt and pepper. Add bell pepper. Cook 1 more minute. Remove from heat. Place cabbage mix in a large bowl. Pour hot sugar mixture over it. Stir to get it mixed in well. Let sit on counter until cabbage is wilted. Cover and refrigerate at least 4 hours or overnight. This entry was posted in Side Dishes and tagged cabbage, coleslaw. Bookmark the permalink. Wow!! This was delicious!! I am not a big fan of coleslaw and generally pass on it but this time I ate most of the bowl! I did a 1/4 cup less on the apple cider vinegar and a tsp or so more of the sugar to balance out the flavors. I used olive oil and added a dash of red pepper flakes to add a little kick to it. Just a little more salt and pepper along with a bit of garlic powder and this was amazing!! I’ll definitely be making this again…in a few weeks actually for an allergy friendly birthday party!! Highly recommend for a mayo alternative!! I think I would leave out the onion next time. I don’t like the onion flavor in coleslaw. And I added another 1/2 cup cider vinegar. I loved this recipe and cooking down the thinly sliced onions. I did put maybe another tablespoon of sugar and white vinegar. But you can do it to taste pinch extra pepper. But on the whole it’s taste good. Yes will make again! I made this recipe and was very disappointed. Had to add more vinegar and sugar to make it taste good…..would not make it again….